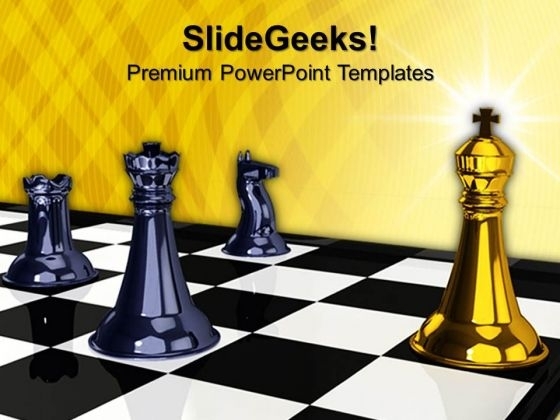 Check Mate Chess Game PowerPoint Templates And PowerPoint Themes 1012-This stunning PowerPoint template consists an image of golden king of leader at the head of chess on chessboard. This image represents business concept. Use this template for presentations on strategies, strategic moves, business choices, main points, your business strengths and weaknesses. Our unique image makes your presentations simpler showing that you care about even the smallest details. Create captivating presentations to deliver comparative and weighted arguments-Check Mate Chess Game PowerPoint Templates And PowerPoint Themes 1012-This PowerPoint template can be used for presentations relating to-"Check mate in chess, teamwork, competition, success, business, games" Progress is inevitable with our Check Mate Chess Game PowerPoint Templates And PowerPoint Themes 1012. Download without worries with our money back guaranteee. Fade away doubts with our Check Mate Chess Game PowerPoint Templates And PowerPoint Themes 1012. You will come out on top. 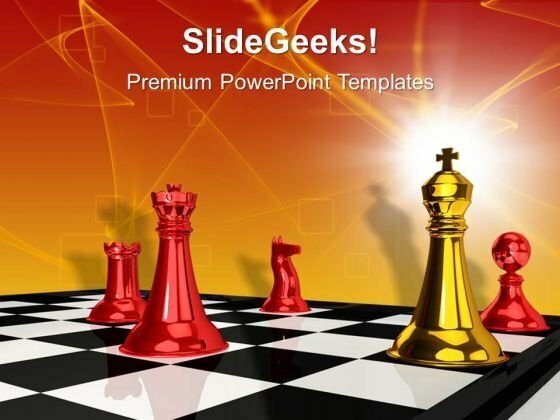 Checkmate Game Leadership PowerPoint Templates And PowerPoint Themes 1012-This stunning PowerPoint template consists an image of golden king of leader at the head of chess on chessboard. This image represents the concept of leadership. Use this template for presentations on strategies, strategic moves, business choices, main points, your business strengths and weaknesses. Our PPT images are so ideally designed that it reveals the very basis of our PPT template are an effective tool to make your clients understand.-Checkmate Game Leadership PowerPoint Templates And PowerPoint Themes 1012-This PowerPoint template can be used for presentations relating to-"Check mate in chess, teamwork, competition, success, business, games" Depend on no one with our Checkmate Game Leadership PowerPoint Templates And PowerPoint Themes 1012. You will come out on top. Critique plans with our Checkmate Game Leadership PowerPoint Templates And PowerPoint Themes 1012. Download without worries with our money back guaranteee.